Circuito San Juan Villicum is preparing for the debut Argentinian WorldSBK round, and fans are prepared for a sensational weekend of on and off track action. 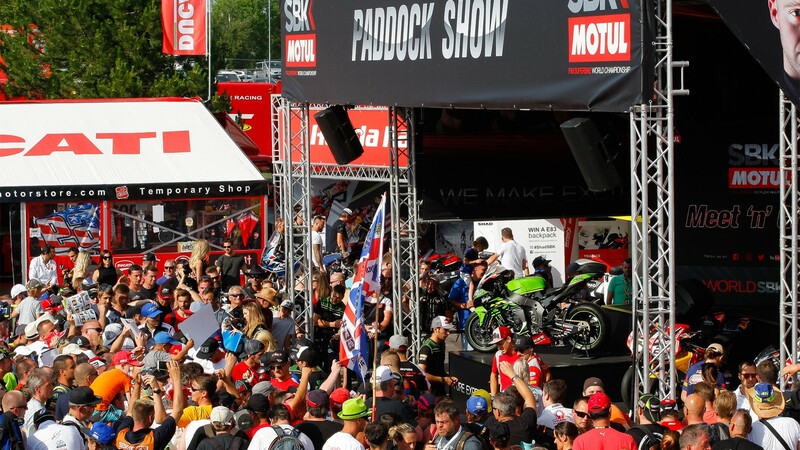 With the Paddock Show the number one attraction for the weekend, there will be plenty more on offer to bring the MOTUL FIM Superbike World Championship action to the fans. Bringing the fan zone into the heart of the paddock, it will welcome Parc Ferme after all the Superpole sessions and races throughout the weekend. Not only will fans get closer to the parc ferme, they will be able to see the podium live in the fan zone, before then hearing from the podium finishers themselves with the all new Race Shows. The fan zone will also welcome some Motul entertainment, Acerbis entertainment, motorcycle displays and the opportunity to support your favourite rider and team with the merchandising stalls. You can then show off your new clothes in the Motul action box in Box 13, where you can enjoy the action from a new view point. But with the Paddock Show offering live commentary of all the sessions out on track, it’s not a weekend to miss. Exclusive to WorldSBK, there will be the traditional interactive shows for fans on Friday afternoon, before the Opening Day Shows from 17.15 – 17.35. Saturday sees the on track action heat up, as well as Paddock Show access, with the WorldSSP qualifying show at 17.25 and the WorldSBK SuperShow at 18.00, where you can get a chance to see all the riders out on stage. Closing the day on Sunday, the Paddock Show will offer more interactive games for fans, and the weekend ends with the WorldSBK and WorldSSP Sofa Racer Chat show to end the weekend in style, as well as hearing from the riders directly after the podiums. Don’t miss the historical weekend of Argentinian action, with children under 12 years old getting free access to the general admission area. You can make the weekend one to remember.